Insecticides » Sevin » IN6805 - Surf the Turf! Bayer Sevin Sl (2.5 Gal) 2/Cs. 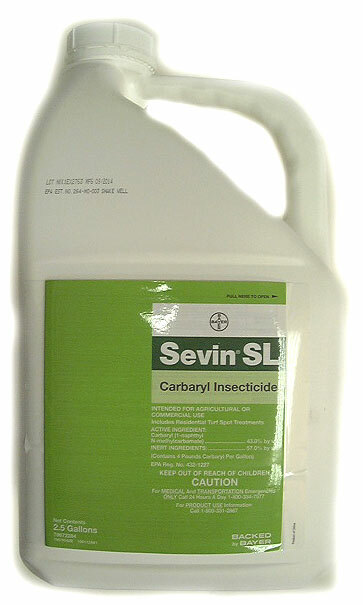 SEVIN carbaryl insecticide provides broad-spectrum control of more than 130 turf and ornamental pests. Sevin has been trusted for more than 35 years by golf course superintendents, arborists, lawn care operators, nursery professionals, and parks and recreation directors to provide effective, curative and preventative insect control. Sevin controls over 100 insects on Lawns, Ornamentals, Fruits, and Vegetables. Insects controls include:Japanese Beetles, Cutworms, Horn/Cabbage Worms, Leafhoppers, Ticks, Fleas, Ants, Grubs, Chiggers, Moths, Grasshoppers, Tent Caterpillars, and many more. Turf Mark Green (2.5gal) 2/Cs. Notify me of updates to Bayer Sevin Sl (2.5 Gal) 2/Cs.